I didn't have a chance to read much during April, as work kept me pretty busy. 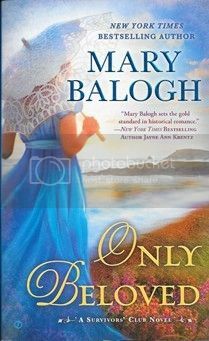 That said, once I got my hands on Mary Balogh's Only Beloved it enchanted me so much I know it would have beat out anything else for book of the month. The seventh and final novel in the Survivors' Club series is one of the best romances I've read in a long time. It tells the story of the George Crabbe, the Duke of Stanhope, who turned his country estate into a hospital and convalescent home for wounded veterans of the Napoleonic Wars. He also founded the Survivors Club by extending care to six terribly damaged patients, all of whom eventually became his friends, confidantes, and fellow club members. What's always interested me about George is what motivated him to do all that (he is, after all, a Duke), and this book reveals his own, heart-wrenching tragedy that led to his son being killed in battle, and his first wife's subsequent suicide. Now that all the other members of the club have married, settled down and started families, George feels a little lonely and left out. Yet when he considers remarrying, there's only one lady who comes to mind -- spinster music teacher Dora Dobbins, the sister-in-law of one of the other survivors. Although George feels a bit old to be contemplating a second marriage, Dora is a woman he admires and believes would make him an excellent companion for the rest of his years. Once George does make up his mind, he goes directly to make an offer to Dora, who is understandably shocked (after all, he's a Duke) but after some honest discussion accepts his proposal. And from this point they should have lived happily ever after, but they both have issues they're hiding from each other. In fact, George's happens to come out right in the middle of their high-society weeding. What I loved about this story is that the main characters are not young people (he's 48; she's 39), and that's pretty rare in this genre. Much as I adore you youngsters, it's a nice change to read about a mature couple's love story. Yes, believe it or not, older people like me still fall in love, all the time. The dynamics are very different from young love or first love, and not easy to pull off, either. I also admire the skill with which the author begins the story like the perfect fairy tale and gradually transforms it to something very different. There's as much hope as heartache, but the underlying suspense just keeps building and building; by the last couple of chapters I was mostly holding my breath between pages. When you do discover the depth and breadth of the secret George has been hiding for so long everything makes sense, but whew. It changes everything you think know about him and what he survived. If you haven't read some or any of the Survivors' Club series you don't have to go back; Mary makes this final novel an excellent standalone while providing the necessary backstory to understand the gist of the other books and characters (although the whole series is pretty amazing, so it wouldn't waste your time to invest in any or all of them.) I highly recommend Only Beloved as a terrific novel that will keep you absorbed from start to finish.